Most of the time these patchy eyesores are due to the common problem of not enough sunshine. So how do we banish these unsightly imperfections in our lawns? Start off by observing how much sunlight the lawn receives. Take note on the type of light the lawn is getting weather it is dappled light coming through the tree canopy or it may be solid shade for part of the day from a nearby fence or building. Once you have established this information consider whether or not your area is suitable for grass to grow. TURF VARIETY: If you are going to lay a new lawn select a variety of lawn that is appropriate and will tolerate the shade this will make your job a lot easier. We recommend Kings Pride Buffalo. TIME OF YEAR: Plant your turf in early spring this will give your lawn time to establish before the harsher winter weather comes along. LESS WEAR: If possible divert foot traffic away for the problem areas as this adds to the lawns struggle of having to contend with limited sunlight as well as heavy wear. MOWING HEIGHT: Mowing height is very important, adjust your lawn mower to a higher level thus leaving more length on the blades of your grass which is key in the shade where light is limited. This extra surface area on the leaf will allow more light to be absorbed by the plant there-for allowing the lawn to produce more energy to grow. CLIPPINGS: After mowing remove any clipping that may be left behind as they will also block the light from getting through. DISEASE: You can’t replace sunlight with water and nutrients. This will add to the problem of disease. Your lawn is more prone to disease from the ground moister present in the shade. Limit your fertilizer applications, in the shaded areas your lawn will only need ½ the nitrogen than the rest for your lawn. Fertilize on the same schedule however adjust the amount. 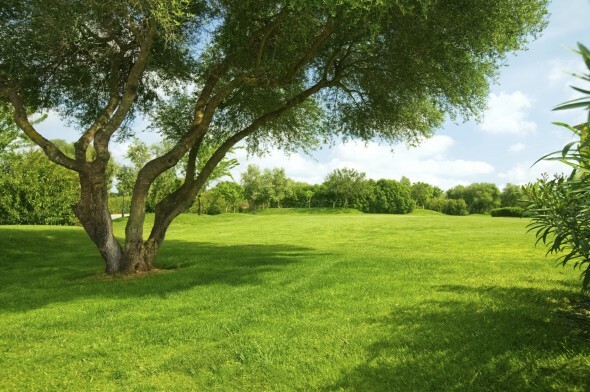 TREE TRIMMING: Trim low laying branches of trees to allow more incidental sunlight in from the sides or consider cutting a few large limbs from the top of the tree canopy to brighten the shade helping you lawn to grow stronger. So with a little observation and care you can have a uniform healthy lawn that you are longing for. The weather’s getting cooler now. Give us a call today and we can provide recommendations on which turf is best for your lawn. Or if you know what you need, feel free to order online from our shop.